Most pigs enjoy some time inside with their family. While rescuing pigs there are several cautions to keep everyone safe and healthy. Do not underestimate the risk of disease. Do not underestimate the risk of pregnancy. Do not underestimate a pig’s determination. Most importantly, do not underestimate the pigs need for companionship. Pigs will not thrive with isolation or boredom. The method of containing the pig(s) indoors will depend on the situation and layout of the house. Pigs may need containment to keep them safe from indoor dangers, they may need separated to avoid pregnancy until a spay and neuter appointment is set, they may need separated for quarantine to avoid disease and parasite transmission, they may need separated until proper introductions have been done to integrate them into the established herd, or they may need separated from other pets in the house such as dogs. Set yourself up for success by providing adequate safety and enrichment for the pig’s time inside the house. SAFETY: Containment is for the safety and welfare of the pigs. Pigs should always be confined to a pig safe area unless the entire house is pig proofed. Pigs should be kept safe from electrical cords that can be chewed, harmful chemicals, medications, other pets that could harm them (such as dogs), separated from other intact pigs, separate from any food storage (pantry or other pet food), and any other dangers that are in the typical household. QUARANTINE: Pigs should always be quarantined when coming into a home with other pigs for the safety of the residing pigs. Click here for quarantine recommendations (LINK). Without quarantine protocol, contagious diseases and parasites can be brought in, infecting your existing pigs or herd. INTACT PIGS: Males and females who are intact, should always be separated. Males have been known to breed as early as 8 weeks old. Females can become pregnant as early as 3 months. It is always better to error on the side of caution and assume if they are unaltered they can breed. Keep them apart. Breeders have often reported pigs breeding through multiple fences, so keep that in mind when looking at how far apart you have your males and females. Boars often get out of fencing that is thought to be pig proof. For this reason boars should be neutered immediately upon arrival at the rescue with sturdy fencing separating them from females for at least two weeks after neuter. To prevent breeding through fencing, there are a couple of solutions. Either double fencing, with two fences about a foot apart, or solid fencing such as flat boards that the pigs cannot penetrate. Indoors, boars may be very destructive when trying to get to an intact female. They may tear through doors or knock down gates or enclosures. Crates are typically a safe place for transport or a short period of time, but this is not an acceptable amount of space for a pig to be contained. BARRIERS: Rule #1, don’t use barriers that you cannot trust to keep the pigs separated. 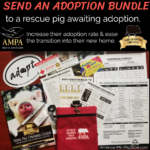 Pigs may need separation for a variety of reasons at a rescue or foster home. Indoor barriers should also be strong enough to withstand a charging or rooting pig. The barriers needed will depend on the reason for separation. If the separation is for disease quarantine, then proper quarantine protocol should be followed. Pigs should not be able to touch each other through fencing, kennels, or baby gates. Diseases and parasites may be transmitted through physical contact, touching noses, blood, sneezing, urine, or feces. Ensure your indoor barriers do not allow any of these to pass from pig to pig. Puppy fencing and baby gates do not provide protection against pregnancy or disease transmission. They are also not sturdy enough to withstand the strength of a determined pig. Crates are great to give each pig a safe place to call his own, to sleep, and for transport. However, these do not provide sufficient space for separating pig’s living quarters. Pigs should not be locked up in bathrooms or other small rooms. The result is often disastrous for both pig and owner. Pigs do not appreciate the confined space and isolation. This causes them to act out, usually destructively. They can uproot toilets, destroy flooring, and/or damage doors and cabinets. A great solution is a dog kennel. These are more often used outdoors, but may also be used indoors to contain and separate pigs. Sizes vary, but 4 ft. by 8 ft. is a common size for these metal kennels in aluminum or steel. The doors are built into the kennel and latch securely. They can be found at home improvement stores such as Lowes or Home Depot, any pet store, or found used through yard sales or Craigslist online. The prices vary from $50-$350 depending on size, quality, and condition. This kennel can be used to contain the pig. To ensure proper quarantine or avoid pregnancy you can keep this kennel secluded in a separate room from other pigs. When introducing healthy pigs, baby gates or puppy fence / play yards may be used with caution. Ideally, introductions will take place over time with the pigs safely separated until their dominance and territorial disputes have subsided. Homemade pens are also popular. These can be built from heavy gauge wire and wood. Again, the importance is strength. The pig will not stay contained if they are able to lift, move, or break through the pen. SPACE: Pigs should be offered adequate space when indoors, even for short periods of time. Pigs are intelligent & social animals that do not thrive confined to small spaces or isolation. Confining them to small crates stacked upon each other is not in the best interest of the pig. Only bring in the number of pigs that you have space for. If space runs out, seek additional foster homes that can provide for the pigs properly. Do not overcrowd the pigs or force them into small spaces. FLOORING: The flooring of a pig’s indoor space may vary depending on his needs. Floors that provide easy cleanup are great for sick pigs or pigs that are not potty trained. Flooring in indoor pens can be made from horse mat stalls, linoleum flooring pressed onto a wooden plank, or leaving the room’s permanent flooring is fine, too. On the other hand, elderly, obese, or arthritic pigs will struggle on slick floors. These pigs may need flooring with a better grip or cushion such as carpet. When introductions are made, pigs should be on a non-slick floor or introduced outside. Introducing pigs on hardwood floor or tile flooring increases the risk of injury to the pigs as they fight and struggle. ENRICHMENT: Pigs are highly intelligent needing stimulation throughout the day. Bored pigs will exhibit unwanted behaviors such as excessive rooting, screaming, whining, and destruction of floors or walls. Ideally, every pig should have several hours each day to spend outside. This outside time provides a valuable opportunity for natural behaviors as well as physical and mental stimulation. Pigs enjoy rooting through the dirt, grazing on grass and weeds, searching for tidbits of food, interacting with other pigs, and napping in the sun. With adequate outside time your pig will also enjoy his indoor family time. If the pig is restless and destructive indoors, then he needs more outside time. There are also many opportunities for enrichment indoors to keep the pigs happy and well adjusted (LINK to enrichment article). TOILETING: Bathroom needs vary by individual pig. Some prefer to potty outdoors and will need a safe place outside to visit throughout the day to meet their toileting needs. Other pigs are comfortable using indoor potty boxes. Popular litter boxes are plastic Rubbermaid totes or kiddie pools. Litter choices vary from pine pellets, newspaper pellets, or puppy pee pads. If using a litter box make sure enough space is available in their enclosure or pen for a litter box while they are indoors.